Crossover. Mass effect. Dead space. Rest In Peace Dead Space 4. That's actually a perfect fit for a crossover. I love how you still go crazy over the Tali aestethic. 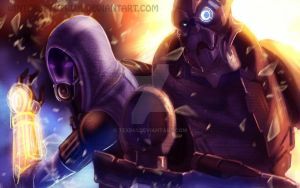 I love your drawings and different versions of Tali and I alway return to your page to see if you got something new. This is a badass design. I think this is my favorite cosplay outfit for Tali yet. Talsaac, Yeet. Great job once again.